The first day of the US Open saw a slew of upsets, with No. 4 seed Kei Nishikori, last year's finalist, going out to Benoit Paire of France and No. 7 seed Ana Ivanovic falling to Dominika Cibulkova of Slovakia. No. 8 seed Karolina Pliskova also lost to US qualifier Anna Tatishvili, with the 25-year-old originally from the country of Georgia getting the 6-2, 6-1 win in less than an hour. Serena Williams(1) def. Vitalia Diatchenko RUS 6-0, 2-0 ret. One of the three US women to suffer losses was USTA National 18s champion Sonya Kenin, who went down to Mariana Duque-Marino of Colombia 6-3. 6-1. Duque-Marino served too well against the obviously nervous 16-year-old from Florida, who had no break point opportunities and committed more unforced errors than usual. Only five US men were in action on Monday, with four of them losing. The sole winner, Mardy Fish, who is retiring after the tournament, defeated Marco Cecchinato 6-7(5), 6-3, 6-1, 6-3 in front of a supportive crowd on the Grandstand Court, which will also be retired after this year. Qualifier Tommy Paul had a 4-1 lead in the first set against No. 25 seed Andreas Seppi of Italy, but lost 11 straight games, as Seppi shook off his early match lethargy. Paul went up 3-0 in the third set, broke Seppi when he served for the match at 5-4, but was immediately broken, with Seppi taking his second chance to close out the victory. NCAA champion Ryan Shane of Virginia nursed an injury for two months after taking the title in Waco, and had only one victory in the four tournaments he played once he returned. Chardy had no difficulty in the first two sets, winning them 6-2, 6-1, but in the third Shane began to find his target with his serve. He hit seven aces and won all but two points when he got his first serve in, but he was broken at 4-4, giving Chardy a chance to serve out the match in straight sets. Shane picked up his only break in that game, with Chardy appearing nervous, and Shane went on to claim the tiebreaker on his second set point, without allowing Chardy a match point. In the fourth set, Shane's serve deserted him, with seven double faults offsetting his six aces, and Chardy took advantage, staying in points until Shane committed an error. Tuesday's schedule will feature NCAA women's champion Jamie Loeb against No. 4 seed Caroline Wozniacki on Arthur Ashe Stadium, while Frances Tiafoe will make his US Open main draw debut against No. 22 seed Viktor Troicki of Serbia on Court 11. John Isner(13) and Jack Sock(28) are the only two seeds among the 18 Americans in action on Tuesday. The mixed doubles draw was released today, with several juniors receiving wild cards. Taylor Fritz and Claire Liu are the only all-junior team, but Tiafoe will be playing with Sachia Vickery and Stefan Kozlov with Christina McHale. Vicky Duval and Christian Harrison were also given a mixed doubles wild card. James Blake and Andy Roddick talked about the upcoming group of American boys in this USA Today interview, conducted by Nick McCarvel. The US Open National Playoffs concluded over the weekend, with all three of the teams earning US Open main draw wild cards having college ties. 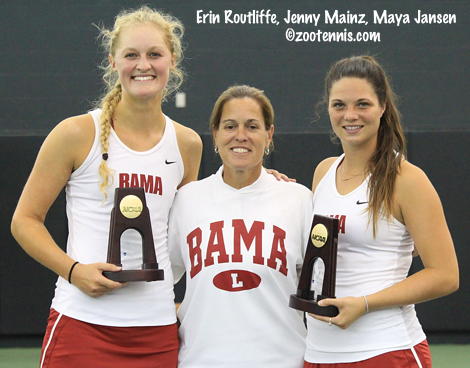 Reigning NCAA champions Erin Routliffe of Canada and Maya Jansen won the women's title, beating Yasmin Schnack and Katsiaryna Zheltova 6-4, 7-5 in the final. Routliffe and Jansen defending their 2014 title this year in Waco, but knowing from their 2014 experience that they would not receive a wild card as NCAA champions due to Routliffe's Canadian citizenship, they entered the Southern section's qualifying and went on to earn the title. They will play No. 6 seeds Abigail Spears (UCLA) and newlywed Raquel Kops-Jones(Cal) in the first round. The mixed doubles wild card went to two former University of Oklahoma stars, Anda Perianu and Andrei Daescu (that is not them pictured on the National Playoffs landing page) Perianu and Daescu defeated Jacqueline Cako and Joel Kielbowicz 6-2, 6-4 in the final. The mixed doubles draw has not yet been released. In other doubles notes, Kalamazoo champions Taylor Fritz and Reilly Opelka have drawn an unseeded team in the first round, Marcus Daniell of New Zealand and Jonathan Marray of Great Britain. San Diego champions Ingrid Neel and Tornado Alicia Black face the unseeded team of Karin Knapp and Roberta Vinci in the opening round. Sabrina Santamaria and Kaitlyn Christian, the 2013 NCAA champions who were overlooked for a wild card that year in spite of both being Americans, received a wild card this year (Santamaria was out with an injury last year) and drew top seeds Martina Hingis and Sania Mirza. The US Open men's doubles draw is here and the women's doubles draw is here. Kriste Ahn, who graduated from Stanford last year, won her second $25,000 title this week in Winnipeg, beating Sharon Fichman of Canada 6-2, 7-5. With the win, Ahn, who was seeded No. 5 in the tournament, will climb near the WTA Top 250 for the first time. She and Lorraine Guillermo (Pepperdine) reached the doubles final, losing to top seeds Fichman and Jovana Jaksic of Serbia. Bobby Knight has recaps of the four former college players--Kevin Anderson, Eric Johnson, Gonzalo Escobar and Tucker Vorster--who won men's titles this week at College Tennis Today. Today is the conclusion of Althea Week, designated in honor of the great African-American tennis pioneer Althea Gibson, who is the subject of Rex Miller's biographical film, which debuted this week in New York. Miller's film will be shown on PBS as part of the network's American Masters Series on Friday, September 4 at 9:00 p.m. Reading the show notes will provide background on how important a figure Gibson was, not just in the tennis world, but in American culture. Top seed Anna Kalinskaya kept intact her perfect record at the ITF Grade 1 International Hard Court Championships Saturday, taking both the singles and doubles titles for the second straight year. The boys champion is new to Grade 1 success, with 15-year-old Felix Auger Aliassime collecting his first title at that ITF level. Both singles finals, played simultaneously on the courts of the Junior Tennis Champions Center, were contested by friends and doubles partners, and both were tense and often error-strewn affairs, but No. 7 seed Auger Aliassime's 6-2, 7-6(6) win over fellow Canadian Denis Shapovalov produced significantly more emotion. At 6-4 in the tiebreaker, Shapovalov served what he thought was an ace on his first serve and the center line judge agreed, giving the good signal. The chair umpire overruled the call however, and Shapovalov argued long and loudly that the serve was good and the chair was incompetent for making such a call. Still seething, he double faulted on his second serve to squander one set point, and Aliassime hit a forehand winner, the only winner of the 14 points played in the tiebreaker, to saved the second set point. Still failing to get his emotions under control, Shapovalov made a backhand error to give Aliassime a match point, and he converted when Shapovalov again double faulted. After the match, Shapovalov, who did not shake the umpire's hand, continued his rant, which including the statement "this guy ruined my week." After several minutes he did calm down, and had an impromptu hit with a young JTCC player, as did Auger Aliassime. "The linesman called it in, and [the chair umpire] changed the call," said the 16-year-old left-hander, seeded 15th. "I shouldn't have gotten as upset as I got, but there shouldn't be calls like that in a match. That was such an important part of the game. That would have been set and it would have been third set now." Auger Aliassime was not sure the overrule was correct, but said, "I play my tennis and they call the lines. It was a tough end, we had a great match all the way, it was intense. I understand his frustration if he really saw it in, but as I said, I'm there to play my tennis and the ref called it out. He's going to be ok, I don't think he's mad at me." Shapovalov's frustration was building after he failed to hold the break he earned to take a 3-2 lead in the second set. After not getting a single break point opportunity in the first set, Shapovalov needed some momentum badly, but he was immediately broken back in the sixth game after failing to convert two break points. Auger Aliassime, who had lost to Shapovalov 6-1, 6-2 just two weeks ago at the Canadian Junior Nationals, said his serve was much better today as was his mental outlook. "Getting beat easily last time, I felt I had less to lose and would have a better match," said Auger Aliassime. "I started out pretty solid, was constructing well my points, playing aggressive and loose at the same time." Auger Aliasimme's level dropped in the second set and Shapovalov brought his up a bit, but Shapovalov, who had gone the distance in three of his wins, was not happy with his overall level of play during the week. "I haven't been playing my best tennis," said Shapovalov. "I've been grinding out matches, winning ugly. So I'm happy to be in the final, and I think Felix has been playing great this whole week. In the first set, he was playing too strong. I couldn't really keep up. I was trying to stay in it, trying to fight. I had chances to maybe win it ugly again, but credit's to Felix for playing great, staying tough and pulling through with the win." Both players are heading to the Grade 1 in Repentigny, Canada next week, then on to the US Open junior championships, where Auger Aliassime is in the main draw and Shapovalov is in qualifying. "Playing at home is always the best," said Auger Aliassime, who is from Montreal and trains at the Tennis Canada National Centre there. "Next week we're in the province of Quebec, so all the people speak French. That's my first language, but I've been working on my English." Kalinskaya may be from Moscow, but the 16-year-old has made the Junior Tennis Champions Center her home during the International Hard Courts for the past two years. She has yet to lose a set in singles or doubles, although in today's 6-4, 7-6(3) win over No. 2 seed Tereza Mihalikova of Slovakia she was a point away from her first third set in two years on five different occasions. Serving at 5-6 in the second set, Kalinskaya saved five set points in the seven-deuce game. "I was up 30-0 and then I did two double faults," said Kalinskaya, who reached the French Open girls final this year. "So my serve was not working good, I was nervous, but in the set points, I started to move better and I won." Mihalikova was disappointed she was unable to capitalize on all those chances to force a third set. "I was so nervous every time when I had advantage," said Mihalikova, the Australian Open girls champion. "When she had advantage, I finally hit the returns I wanted, and said to myself, why not when I had set point? On my set point, every time I did mistakes, she didn't need to do something." Kalinskaya recognized the match was not the highest quality, and provided a possible reason. "It was difficult to take her serve, because she served very well, but I think we both did a lot of mistakes, I think we could do better," said Kalinskaya. "Maybe because we're friends." In the tiebreaker, errors were more common than winners, but a let called by the chair umpire that neither player heard proved to be Mihalikova's undoing. Looking incredulously at Kalinskaya and at the chair umpire after what appeared to be an ace, Mihalikova ended up double faulting at 5-3, and Kalinskaya converted the first of her three match points with a perfectly executed drop shot. Although not as demonstrative as Shapovalov, Mihalikova made it clear that the officiating was not to her liking today. "They made some--a lot--of mistakes," the 17-year-old said with a smile. "But still, I should play. Today I made a lot of mistakes, and when it was the important time, I did a mistake and Anya won the ball. So today, she deserved it." Kalinskaya said after the singles match that she was determined to get her friend the doubles title, and the pair again dominated, beating No. 2 seeds Vera Lapko and Iryna Shymanovich of Belarus 6-1, 6-4 in the final. The top seeds did not lose a set in their five wins. Kalinskaya, who won the doubles title last year with Evgeniya Levashova, is not playing the Grade 1 next week, nor is Mihalikova. But Kalinskaya believes her success this week, her first tournament of the summer on hard courts, will help her at the US Open Junior Championships. "This is very good preparation for the US Open," said Kalinskaya who turns 17 in December. "That's why I came here," said Mihalikova. "I came here from clay and it was just so fast for me. But now it's ok. I am already ready for the hard courts and I want to do well in the US Open so bad." A rematch of the recent Canadian National Junior final is set for Saturday, after No. 15 seed Denis Shapovalov and No. 7 seed Felix Auger Aliassime advanced to the finals of the ITF Grade 1 International Hard Court Championships in contrasting fashion. Top seed Anna Kalinskaya of Russia will go for her second straight sweep of the girls titles when she takes on No. 2 seed Tereza Mihalikova of Slovakia in Saturday morning's finals. Shapovalov had been taken to three sets three times in his first four matches, but against qualifier Jake Van Emburgh, the 16-year-old left-hander needed only 53 minutes to post a 6-0, 6-2 victory. "I got off to a good start today very quickly," Shapovalov said. "I felt more comfortable on the courts. And I think he was a bit tired today, he's had a long week, but playing very well. He came out a little flat today and he got a bit frustrated and I took advantage of that." Shapovalov took the first 11 games of the match, with Van Emburgh holding and breaking before losing his last service game. "At 5-0, I lost a little bit of focus, lost two games, but I bounced right back." Shapovalov's friend and doubles partner Auger Aliassime needed to bounce back more urgently in his semifinal with No. 14 seed Alex De Minaur of Australia, but for the second time in the tournament, the 15-year-old came from a set down, this time recording a 3-6, 6-3, 6-4 win. "He was a tough opponent and I had some difficulties understanding his game," Auger Aliassime said. "He was crafty. The beginning of the match was tough, but I adapted and started playing better, looser." De Minaur's level dropped in the second set, and once Auger Aliassime got a break to open the third, he relaxed and just focused on winning his serve the remainder of the match, which he did without facing a break point. Just last week in the Canadian National 18s final, Shapovalov defeated Auger Aliassime 6-1, 6-2, but there's no chance he'll be overconfident. "I think he wants his revenge, and I've been teasing him about killing him," Shapovalov said. "But I think it's going to be a great match, he's a great player. It's not going to be easy again for sure." Auger Aliassime, who is the youngest player ever to be ranked in the ATP Top 750, acknowledges that competing in junior tournaments has different dynamics. "Playing in Challengers I was playing without any stress," said Auger Aliassime, who qualified and the reached the quarterfinals of the $100,000 Granby Challenger in Canada last month. "I was just there to get experience, and I was playing looser than here. I felt like sometimes in some matches here you have some things to defend. But I try to continue to play loose and have fun on the court. I'm still young, in the juniors, so I have a lot to learn." Auger Aliassime and Shapovalov have played only once before in competition back in the 12s, with Auger Aliassime winning that one, but there have been many practices matches between the two. "We talked about it yesterday, that maybe I could get a rematch," said Auger Aliassime. "He's a great player and it's always tough to play him. I'm motivated to win for sure. I know what to prepare myself for and I think it's going to be a great battle, yeah." The girls final will also be between two friends and doubles partners after Kalinskaya ended the impressive run of qualifier Madison Battaglia 6-1, 6-4 and Mihalikova defeated No. 5 seed Vera Lapko of Belarus 4-6, 6-4, 6-3. Mihalikova will have had practice playing against a friend, as she and Lapko are also close. "It was a very tough match, because me and Vera are very good friends," said Mihalikova, the reigning Australian Open girls champion. "It was hard psychologically, to play her, and we didn't play our best today and I saw it, because we were both too nervous. But every time it got to important games I broke her down, so I was more up today." Mihalikova, 17, avenged her third round loss to Lapko at Wimbledon this year and will be looking to even her record against the 16-year-old Kalinskaya, who beat her in a 14s tournament in their only previous meeting. Kalinskaya said she has yet to play her best tennis in College Park, but she has yet to drop a set in her consecutive 11 wins at the International Hard Courts. "I like this tournament a lot," Kalinskaya said. "It's very good organization, and courts, very good. I play well here, not my best, but well." "It's going to be fun with Anya," said Mihalikova. "I hope it will be good match and we will enjoy it, and afterward we will win the doubles." Top seeds Mihalikova and Kalinskaya will play No. 2 seeds Lapko and Irinia Shymanovich of Belarus in the girls doubles final Saturday. Mihalikova and Kalinskaya beat unseeded Elysia Bolton and Clarissa Hand 6-4, 6-4 in the semifinals and have yet to drop a set in the tournament. Lapko and Shymanovich have also gotten through to the finals without needing a match tiebreaker. They defeated the unseeded Chinese team of Siqi Cao and Shuyue Ma 6-4, 6-4. The boys semifinals and finals were played Friday afternoon when No. 3 seeds Shapovalov and Auger Aliassime lost to Andres Andrade of Ecuador and Benjamin Hannestad of Denmark 6-4, 6-4. 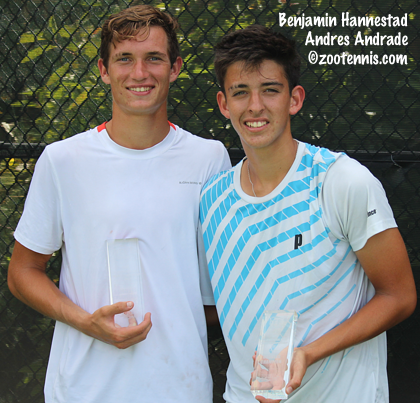 With the two singles finalists out of the doubles, the final could be played, and Andrade and Hannestad took the title, beating top seeds Yunseong Chung of Korea and Casper Ruud of Norway 6-1, 7-5. Chung and Ruud had beaten No. 5 seeds Alexey Aleshchev of Russia and Hady Habib 7-6(3), 7-5 in the morning semifinal. Hannestad and Andrade both train at the IMG Academy, but this is their first tournament playing as team. "We've just been practicing together the past week," said Andrade, "and we've been playing great doubles. We had a tough match in the semis, the two Canadians were pretty tough." "I wouldn't say I was surprised," said Hannestad. "We had had a huge level in practice and had fun. We've been very focused on the doubles." Andrade credited his partner with outstanding returns, and Hannestad was the one who took the deciding points. He wasn't able to get Chung's serve back on their first deciding/match point at 5-4, but on the second deciding/match point, Hannestad's backhand return was too much for Chung to handle. "We both know how to move well at the net, and we move together, not as a singles team. I feel we're very united," said Hannestad. Hannestad is heading to the Grade 1 in Canada, which starts Monday, but Andrade is not, so they are not sure when their next tournament together will be. The draws and Saturday's order of play is available at the tournament website. 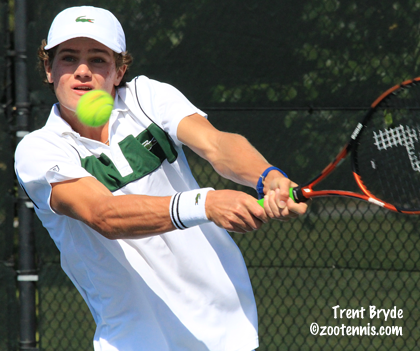 Four Americans qualified for the main draw of the US Open today, including 18-year-old wild card Tommy Paul. Paul is the first boy I can recall who played Kalamazoo and went on to qualify for the US Open. Paul is one of four players(Andrey Rublev, Frances Tiafoe, Alexander Zverev) still eligible for ITF junior competition to reach the men's main draw, with Zverev and Rublev qualifying today. Paul will play No. 25 seed Andreas Seppi of Italy on Monday. The ATP website has a report on the men's qualifying with a quote from Paul. Anna Tatishvili, Shelby Rogers and Jessica Pegula are the US women who advanced with wins today. 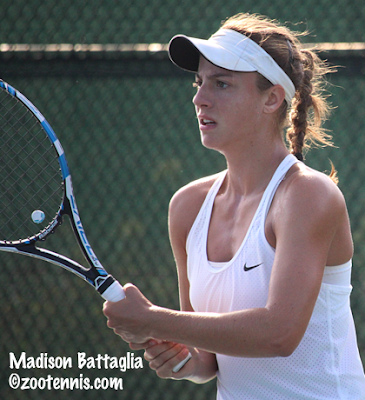 Madison Battaglia and Jake Van Emburgh are hardly the most likely semifinalists at the ITF Grade 1 International Hard Court Championships, but both qualifiers have proved their mettle throughout the week to join six high-profile juniors in the tournament's Final Four. Battaglia, who has played seven matches over the past six days, earned her third straight win over a seeded player Thursday, defeating No. 6 seed Iryna Shymanovich of Belarus 6-4, 6-7(3), 6-3 after three hours and 30 minutes. Battaglia served for the match at 6-4, 5-4 and had a match point, but the former world No. 2 junior wasn't quite ready to concede. A good backhand return forced an error from Battaglia on match point, and Shymanovich broke back on one of her many effective drop shots. The errors Shymanovich had been giving Battaglia disappeared in the second set tiebreaker, and Battaglia had to regroup before beginning her first third set of the tournament. "I just tried to come and forget about the second set, just start fresh and stay calm and focused as possible," said the 17-year-old from New York, playing in just her third ITF event. "I think I was. It was a very up and down match, it kept flipping, there were a lot of deuces and everything, so I just tried to stay as positive as possible." With Shymanovich serving at at 3-4 in the third set, Battaglia got the break, and for the second time, and well over an hour after the first, served for the match. Up 30-0, she lost the next three points, but a good first serve had Shymanovich netting the backhand return. A Shymanovich backhand long gave Battaglia her second match point, and this time she converted, with a Shymanovich sending a return long. Battaglia said she didn't know that Shymanovich had reached two junior slam quarterfinals last year, but she wasn't going to be intimidated by her opponent's resume regardless. "I didn't look that deep into it, but I knew she had played Wimbledon, US Open, the other slams," said Battaglia, who trains at the John McEnroe Tennis Academy. "She's from Belarus, so I'm sure she plays only ITFs, which changes the rankings a little bit." Next up for Battaglia is top seed and defending champion Anna Kalinskaya of Russia, who defeated No. 8 seed Maia Lumsden of Great Britain 6-2, 6-4. "It's really exciting," said Battaglia, who said the mild weather and just one match a day has helped keep her fresh despite all the matches she has played. "It's all positive. I'm just trying to enjoy it as much as possible and have fun. I've been playing great matches with great players, so everything is just really positive." The other semifinals will feature No. 5 seed Vera Lapko against No. 2 seed Tereza Mihalikova. Lapko defeated unseeded Kelly Chen 7-5, 7-6(4) and Mihalikova put an end to 13-year-old qualifier Amanda Anisimova's impressive run 6-3, 7-6(3). Van Emburgh did not come into the tournament with much confidence, but he advanced to the semifinals with a 6-2, 6-4 win over unseeded Trent Bryde. "I had been playing the worst tennis of my life in practice," said the 16-year-old from Wisconsin, who recently began training at the IMG Academy in Bradenton. "And at Kzoo, I was really sick. But the weeks leading up to this I was just playing terrible in practice, just awful. So I didn't come here and think I was going to semi, I was trying to get some points because I'm not playing too well and just get some matches, and all of a sudden, I just started playing good. The timing clicked, and I'm not getting broken at all." Van Emburgh, who defeated No. 8 seed Benjamin Hannestad of Denmark in the first round and No. 10 seed Artem Dubrivnyy of Russia in the third round, said he played well in the first set against Bryde, but then counted on holding his serve when his level dropped in the second set. "I was controlling everything in the first set," said Van Emburgh, also playing in just his third ITF tournament. "There really wasn't anything he could do. But then we both sort of got tight and started missing, and it was kind of like, who's going to miss first. No one was striking the ball well in that second set." When Van Emburgh went to serve out the match, Bryde's comeback in his second round victory, in which Bryde saved five match points, wasn't far from his mind. "I had a match point at 3-5," said Van Emburgh, who has played six matches in the past six days. "And he saved one, and I thought, here we go again." But Van Emburgh was able to think positively in the final game. "I thought if I get tight, I'm not going to hit the serve that I need to hit," Van Emburgh said. "So I just went up loose and swung free on the first serve. I missed three first serves in that game (an ace got him to 40-15 however), but my second serve I'm feeling really confident with right now. It's kicking really high and getting me on the offense, which is helping a lot." Van Emburgh finished with a forehand winner to set up a meeting with No. 15 seed Denis Shapovalov of Canada, who won his third three-set match of the week, beating No. 6 seed Alberto Lim of the Philippines 6-4, 4-6, 7-5. Lim had served for the match at 5-4 in the third set, but never got closer than two points from the win. No. 14 seeed Alex De Minaur of Australia defeated No. 5 seed Nathan Ponwith 6-2, 7-5, leaving his opponent, No. 7 seed Felix Auger Aliassime of Canada as the top remaining boys seed. Auger Aliassime defeated unseeded Alex Rotsaert 6-2, 6-2. Shapovalov and Auger Aliassime, the No. 3 seeds, have advanced to the doubles semifinals, where they will face the unseeded team of Hannestad and Andres Andrade of Ecuador. Top seeds Yunseong Chung of Korea and Casper Ruud will face No. 5 seeds Alexey Aleshchev of Russia and Hady Habib in the other boys doubles semifinal. In the girls doubles semifinals, top seeds Kalinskaya and Mihalikova will play unseeded Elysia Bolton and Clarissa Hand, while No. 2 seeds Lapko and Shymanovich face unseeded Siqi Cao and Shuyue Ma of China. For complete results and Friday's order of play, see the tournament website. Seven Americans have reached the final round of qualifying at the US Open, including three teenagers: 15-year-old Claire Liu, 16-year-old CiCi Bellis and 18-year-old Tommy Paul. The results of today's second round and the matchups for Friday's final round for US players are below. The men's and women's singles draws were released today, with 19 US women and 15 US men competing (possibly more, pending the results of qualifying). Kalamazoo champion Frances Tiafoe has drawn No. 22 seed Viktor Troicki of Serbia, and San Diego champion Sonya Kenin will play Mariana Duque-Marino of Colombia. NCAA men's champion Ryan Shane faces No. 27 seed Jeremy Chardy of France, and NCAA women's champion Jamie Loeb meets No. 4 seed Caroline Wozniacki of Denmark. Loeb, who according to this New York Daily News article has turned pro after completing her sophomore year at North Carolina, is the second NCAA champion Wozniacki will have faced in the US Open. 2010 NCAA champion Chelsey Gullickson lost to No. 1 seed Wozniacki in the first round that year. In other pro news, Taylor Fritz, who had said he would make a decision regarding his status by the US Open at the latest, has signed with CAA, according to this release. He and Reilly Opelka are playing in the main draw of doubles with the wild card they earned winning Kalamazoo. Three qualifiers, all playing in just the third ITF tournament of their junior careers, advanced to the quarterfinals of the Grade 1 International Hard Court Championships with straight set wins on an unusually refreshing midsummer day in the Washington DC area. Amanda Anisimova, who will be 14 next Monday, continued her run, posting her fifth consecutive straight-set win, which includes two qualifying victories over the weekend. In Wednesday's third round, Anisimova beat unseeded Abigail Desiatnikov 6-4, 7-5, saving two set points with USTA 16s girls champion Desiatnikov serving at 5-3 in the second set. Anisimova will face No. 2 seed and Australian Open girls champion Tereza Mihalikova of Slovakia in the quarterfinals, with Mihalikova defeating Karman Thandi of India 6-3, 6-0. The second girls qualifier to reach the quarterfinals is 17-year-old Madison Battaglia, who took out a seed for the second day in a row. Battaglia defeated No. 14 seed Jessica Hinojosa Gomez of Mexico 6-3, 6-3, with No. 6 seed Iryna Shymanovich of Belarus her opponent on Thursday. Battaglia, who won an ITF Grade 5 title in Bermuda this summer, said her lack of familiarity with her international opponents has allowed her to concentrate on her own game. "I haven't really known most of the people I've played, which is a good thing," said Battaglia, who defeated No. 3 seed and ITF No. 17 Wushuang Zheng of China 6-1, 6-3 on Tuesday. "I've never played them, I don't know anybody they've played, so it's just going in there, focusing on myself, playing my game and having fun." Hinojosa Gomez took a medical timeout right after breaking Battaglia, who was serving at 3-1 in the second set, but Battaglia didn't let that disruption bother her. "I stay relaxed, and I took a couple of practice serves and then came out and played even better," said the New Yorker, who trains at the John McEnroe Academy. "I didn't worry about what was wrong with her. I just went out there and played." Battaglia, who won three matches in qualifying, called her win over Zheng "a good confidence boost. And I thought today, I played really well." As for her decision to begin playing ITF tournaments this summer, Battaglia said her coach Felix Alvarado, who also coached Jamie Loeb throughout her junior career, encouraged it. 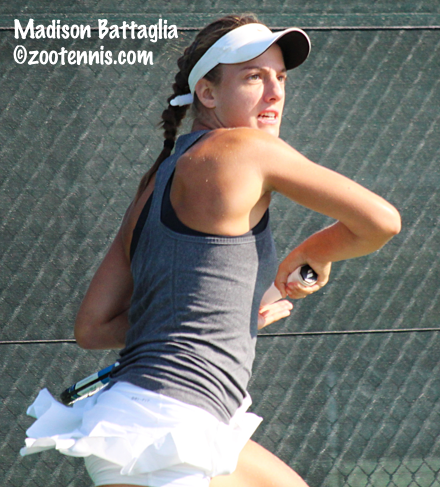 "I did really well last year in my section in USTA," said Battaglia. "So I wanted to play different tournaments and my coach wanted me to play ITFs to see how they go. So I played the Grass Courts, my first one, because that was close to home. Then I played Bermuda, and this is my third one, because this was close to home too, relatively close. I thought it would be good to go to, and it has been been really fun so far." In addition to the two qualifiers, one other unseeded American girl advanced to the quarterfinals, with Kelly Chen defeating No. 13 seed Ioana Pietroiu 6-2, 6-2. Chen will play No. 5 seed Vera Lapko of Belarus, a Wimbledon semifinalist, in the quarterfinals. Top seed and defending champion Anna Kalinskaya of Russia had her hands full with 13-year-old wild card Caty McNally, barely avoiding a third set in her 7-5, 7-6(9) win. McNally had two set points in the tiebreaker, but Kalinskaya came up with big shots on both. For her part, McNally saved three match points in the tiebreaker, but double faulted on the fourth to give Kalinskaya the win. The Russian will play No. 8 seed Maia Lumsden of Great Britain, who beat Kylie McKenzie 7-5, 6-2. The third qualifier in the quarterfinals is Jake Van Emburgh, who beat No. 10 seed Artem Dubrivnyy of Russia 6-2, 6-4. Van Emburgh's win, his second over a seed, assured an American boys semifinalist, with Van Emburgh facing unseeded Trent Bryde next. Bryde defeated qualifier Oliver Crawford 7-5, 6-1. Australian Alex De Minaur defeated No. 2 seed Casper Ruud of Norway 6-2, 6-4, leaving No. 5 seed Nathan Ponwith as the highest seed remaining in the boys draw. Ponwith overcame a slow start against No. 12 seed Lev Kazakov of Russia, but earned a 6-7(5) 6-1, 6-1 victory to set up a meeting with De Minaur in the quarterfinals. Kalamazoo 16s finalist Alexandre Rotsaert had played his first two matches at the University of Maryland courts, so adjustments for the faster courts at the Junior Tennis Champions Center were necessary. He managed to find his game just in time, beating Alan Rubio Fierros of Mexico 2-6, 7-6(3), 6-3, after Rubio Fierros had served for the match at 6-5 in the second set. "I had practiced on these courts, but I hadn't played any matches on them," said Rotsaert. "They're much faster over here, so this was like a first round for me. I came out and everything was like a blur....slowly, slowly I started playing a little better. At 6-5, I was a little worried. I kind of earned it, but he kind of gave it to me too, a couple of stupid errors and he started cramping a bit. He started getting a little impatient, going for shots he shouldn't have and I capitalized on that and had a really good breaker." Rubio Fierros began to really struggle with his movement, apparently due to cramps, late in the third set, and became very aggressive as a result. "At 5-3 in the third, he just started ripping it," said Rotsaert, who showed no signs of any fatigue during the three-hour match. "Going ace, ace, and I was like, what's going on?" But Rotsaert said he has learned to ignore the disruption that a visible injury or illness can create, and he closed out the match with no further difficulty. Next up for Rotsaert is No. 7 seed Felix Auger Aliassime of Canada, who defeated unseeded Vasil Kirkov 6-3, 6-2. "I'm excited to play Felix, he's such a great player," said Rotsaert. "I really look forward to try and give it my best." Rotsaert has respect for Auger Aliassime's ATP Challenger victories, but he's not intimidated by those results. "He's a really good player, but he's a kid, like all of us," Rotsaert said. "You have to be able to do it, but he's playing with no pressure [in ATP Challengers]. Coming into a junior tournament, it's much tougher, everyone here's gunning for you. I was hoping to get him first round, but I guess it's the quarters." The fourth quarterfinal will be between No. 15 seed Denis Shapovalov of Canada and No. 6 seed Alberto Lim of the Philippines, both of whom won three-set struggles. Shapovalov defeated unseeded Gianni Ross 6-7(6), 6-3, 6-2 and Lim got by his doubles partner Tung-lin Wu of China, the No. 9 seed, 3-6, 6-3, 6-3. Complete draws and Thursday's order of play can be found at JTCC.org. On the second day of qualifying at the US Open, American players had five wins and ten losses. Complete US results from today's first round and the Thursday second round matches of the 15 Americans remaining are below. Monday's heat and humidity gave way to much more pleasant conditions for the second round of the ITF Grade 1 International Hard Court Championships, and after a dozen seeds lost in the opening round, Tuesday saw only three fall, all in the girls draw, with US girls responsible for those upsets. Qualifier Madison Battaglia defeated No. 3 seed Wushuang Zheng of China 6-1, 6-3 at the University of Maryland site, and qualifier Clarissa Hand also took out a seed there, beating Destanee Aiava of Australia 6-4, 1-6, 6-3. 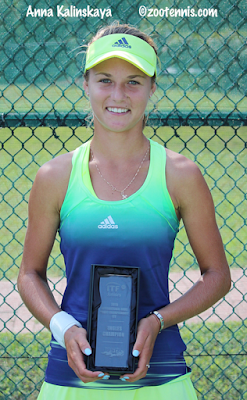 USTA National 16s champion Abigail Desiatnikov, a wild card, topped No. 10 seed Deria Nur Maliza of Indonesia 7-6(0), 6-4. Desiatnikov, just 14, will play an even younger American in the third round Wednesday when she takes on 13-year-old Amanda Anisimova. Anisimova defeated Gabby Pollner 7-5, 6-2 to reach the third round of a Grade 1 for the first time. Top seed Anna Kalinskaya of Russia and No. 2 seed Tereza Mihalikova of Slovakia had no difficulty moving into the third round, with Kalinskaya, the French Open girls finalist, defeating qualifier Dalayna Hewitt 6-2, 6-2 and Mihalikova, the Australian Open girls champion, beating Maria Mateas 6-0, 6-1. Kalinskaya's opponent on Wednesday will be 13-year-old Caty McNally, who defeated Mihika Yadav of India 6-3, 6-0. One day after getting a big win over Yunseong Chung when the top seed from Korea retired after losing the first set 7-5, Trent Bryde had another memorable victory at the ITF Grade International Hard Courts, saving five match points to defeat Juan Carlos Aguilar of Bolivia 4-6, 7-6(5), 7-5 to move into the third round. With Aguilar serving for the match 6-5 in the second set, Bryde fought off four match points, but that appeared to be for naught when he went down 5-1 in the ensuing tiebreaker. Six points later, he had earned a third set, closing it out on a forehand volley, which he followed with a huge roar. Down 4-1 in the third set, Bryde was again one point from a loss, but he saved match point No. 5 with yet another forehand volley winner with Aguilar serving at 5-3, 40-30. Aguilar didn't betray much frustration when so many opportunities slipped away, but a couple of double faults, one in that ninth game and another at 5-all indicated the stress he was feeling. Although Aguilar had not made many unforced errors when building his lead, they began to accumulate in the late stages of the three-hour and 15-minute marathon, and a backhand long gave Bryde a chance to serve for the match. A forehand winner helped Bryde take a 40-15 lead, but Aguilar's forehand forced an error from Bryde. Bryde didn't wait to engage in a rally on the second match point, playing a textbook serve-and-volley point to complete the comeback. "I've actually been working on that," Bryde said. "I've been serving a lot better and coming in a lot more off of it. It's helped me a lot." Bryde applied pressure and played more aggressively on several of the key points of the match, but Aguilar also appeared to be getting tight as the chances slipped away. "I felt he was definitely nervous," said Bryde, who recalls saving seven match points several years ago in a sectional match. "I pressured him a lot on those points; I tried to play as if I had nothing to lose, but on some of those, he did have some loose errors. I did try returning deep and coming in, because I knew he would get tight when I would come in and he'd either give me a floater or he'd miss it." Bryde, who turned 16 on Monday, admitted he was still processing the endings to his last two wins. "First day, shocking, the guy just retires, and the next day, I just, I don't even know how to describe it," Bryde said. "I just came up clutch, and somehow I won. Both matches, I don't know how I won, but I won." Bryde will play friend and rival Oliver Crawford for a place in the quarterfinals after Crawford, a qualifier, defeated wild card Nikolai Parodi 6-3, 6-4. "We've actually played a lot," Bryde said. "He beat me two or three times a while ago, a couple of years ago, but the last two times I've played him, I beat him both times. But he's a really tough opponent, makes a lot of balls and really makes you work for every point." As in the girls round of 16, there are seven Americans remaining in the boys draw, with No. 5 Nathan Ponwith the only seed. Ponwith defeated lucky loser Zummy Bauer 6-1, 6-2 and will play No. 12 seed Lev Kazakov of Russia Wednesday. Ten of the 19 Americans in action won their first round qualifying matches at the US Open today, including six teenagers. Wild cards Noah Rubin, Tommy Paul, Raveena Kingsley, Vicky Duval and Claire Liu won, as did CiCi Bellis. Below are the results of the Americans in action today, followed by a list of the 15 who will play their first round matches on Wednesday. It was a hot and busy first day at the ITF Grade 1 International Hard Court Championships, and I'll have more about all the upsets later in the post. My interview with No. 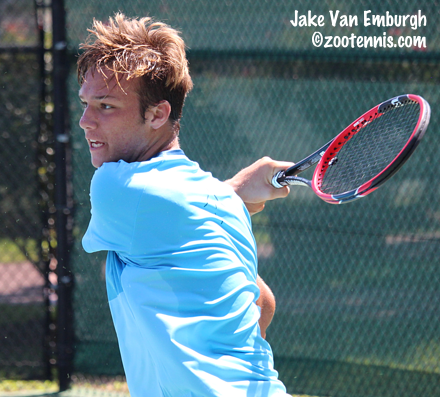 1 Class of 2015 recruit Alex Rybakov, who recently signed with TCU and will begin school in January, is available today at the Tennis Recruiting Network. 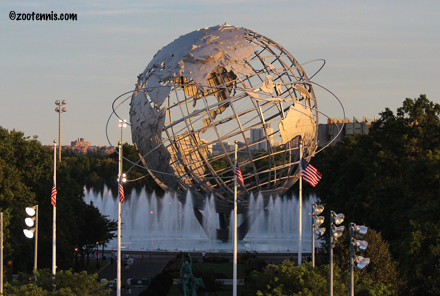 The US Open National Playoffs singles tournaments concluded today, with No. 4 seed Jennifer Elie and No. 2 seed Jesse Witten taking the ninth and final wild card spots in the qualifying draws. 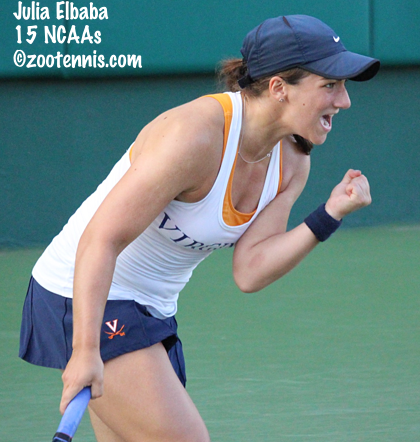 Elie beat Virginia senior Julia Elbaba 6-4, 4-6, 7-5 in a match that took three hours and 30 minutes to decide. Elie, 28, will be making her first appearance at the US Open. Witten, 32, defeated top seed Matija Pecotic of Croatia 7-6(4), 7-6(3) to earn his qualifying wild card. His best result at the US Open came in 2009, when he qualified and reached the third round before losing to No. 4 seed Novak Djokovic in four sets. The doubles portion of the US Open National Playoffs begins on Tuesday, with main draw wild cards on the line for the women's, men's and mixed events. The complete draws can be found at usopen.org. Jonathan Kelley has more on the US players in qualifying at his On The Rise blog. Now on to the the action at the International Hard Court Championships, where twelve seeds lost in the opening round, including No. 1 seed Yunseong Chung of Korea. Chung, who was competing in the semifinals of a Korean Futures just two days ago (or three, depending on which date line you use) and Trent Bryde were engaged in a tough first set, with neither able to get a break. Then with Chung serving at 5-6, he went down 0-30, and a perfectly executed drop shot by Bryde gave him three set points. He converted the first when Chung made a forehand error, and as they walked to their chairs, Chung told the umpire he was retiring. "I'm not sure what was wrong with him," said Bryde, who is celebrating his 16th birthday today. "He seemed a little tired during kind of the whole match, but I don't think there was any physical injury. I was really surprised. I did not see that coming. I was in shock at first. It took a while for it to sink in that I actually won the match." Chung gave his reason for his retirement as a headache, and Bryde said he was not aware that Chung had traveled from Korea in the past two days. "I think I heard he came in not too long ago, so he could have been tired from that; it probably had a lot to do with it," Bryde said. Despite the abrupt ending to the match, Bryde was happy with his performance and the result, appreciating the chance to play the ITF's No. 11 junior. "I thought I served really well and was clutch on my break points," Bryde said. "I was actually really excited, honestly. I thought it was a chance to make this one of my best birthdays, and it has been. I'm really happy." The boys draw also lost its third and fourth seeds, with Robert Loeb defeating No. 3 seed Franco Capalbo of Argentina 6-3, 7-6(5) at the University of Maryland site, and No. 4 seed Djurabeck Karimov of Uzbekistan pulling out due to injury. No. 8 seed Benjamin Hannesad of Denmark lost to qualifier Jake Van Emburgh 6-3, 6-7(8), 6-1, No. 11 seed Yousef Hossam of Egypt lost to John Jorgeson 7-6(6), 1-6, 6-3, No. 16 seed Alexey Aleshchev of Russia lost to Alexandre Rotsaert 6-2, 6-4 and No. 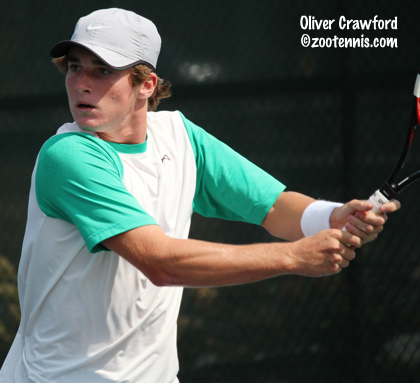 13 seed Sam Riffice lost to qualifier Oliver Crawford 6-3, 3-6, 7-6(5). Riffice was serving up 4-1 in the third set and was up 5-2 in the final tiebreaker, while Crawford was struggling with a calf injury he had suffered early in the third set. "At 1-all in the third set, I hit an overhead and came down on my left leg, and something happened there," said Crawford, who did not call for a trainer in spite of the obvious pain he was experiencing on certain shots. "I felt a little bit of cramping there, but it was mostly the pain in my left leg that was affecting some of my movement." As for his comeback, Crawford didn't give himself much credit for that. "I didn't change anything," said the 16-year-old from South Carolina. "His level dropped. I don't think he played his best tennis today, so I was lucky to get through that with what I was going through. He let down his guard a little bit 4-1 up, go for a little more, and I just stayed in there and tried to keep fighting." Down 5-2 in the tiebreaker, Crawford played two aggressive points, hitting a clean third-ball backhand down the line winner on the first and coming up with a good first serve on the second to make it 5-4. A good return caught Riffice off guard and he netted a backhand, and when Riffice lost the next point on his serve, netting a forehand, Crawford had an improbable match point. He hit a big forehand, close to the baseline, drawing another error and had secured what he called one of his biggest wins. He also admitted that he played more aggressively than usual in the third set, due to the injury. "I had to," said Crawford, "just because I wasn't moving as well as I possibly could, I guess. I was trying to put as much pressure on him as I could, and I was winning some and losing some, but I had to. The courts are fast, so when I was hitting out on the ball more, I felt it was helping me a lot." Amanda Anisimova said she needed to make some adjustments for the faster surface, but once she did, the 13-year-old rolled to a 6-2, 6-2 win over No. 7 seed Anastasia Potapova of Russia. "I hit with a lot of spin, because they were really, really fast," said Anisimova, another qualifier who beat a seed in the first round. "Qualifying helped me, because these are really different courts from what I usually practice on." Serving at 3-2 in the first set, Anisimova went down 0-40, but came back to win the game, as Potapova, a junior Wimbledon quarterfinalist, struggled to stay in the rallies. "I started to get behind the ball and play way better," said the Floridian of that turning point in the match. "I was thinking about what I'm going to do between points, and making my serves." Anisimova considers Potapova a friend, having practiced with her previously and spent time with her at the ITF World Junior Tennis Team competition earlier this month, where the Russian team defeated the USA team in the finals. "I played three, but I was happy for my teammates," Anisimova said, speaking of Caty McNally and Hurricane Tyra Black. "We had a tough loss [in the final], but we played pretty well the whole tournament." As for beating Potapova, Anisimova called it "probably my best win. I thought it would be tougher, be a pretty hard match. Overall it was pretty tough in the games, but the score didn't show it." Anisimova's teammate McNally also picked up a win over a seeded player. The 13-year-old wild card defeated No. 16 seed Thaisa Pedretti of Brazil 4-6, 6-2, 6-1. Black lost to No. 10 seed Deria Nur Haliza of Indonesia 6-4, 6-1. Kelly Chen took out No. 4 seed Pranjala Yadlapalli of India 5-7, 6-4, 6-2 and Kylie McKenzie defeated No. 12 seed Georgia Craciun of Romania 6-3, 6-2. No. 15 seed Alexandra Sanford, the only US girl seeded in the tournament, lost to Karman Thandi of India 6-4, 7-6(5). Top seed and defending champion Anna Kalinskaya of Russia defeated qualifier Elysia Bolton 6-4, 6-0 and No. 2 seed Tereza Mihalikova of Slovakia beat Juliana Valero of Colombia 6-2, 6-2. Complete draws, including doubles draws, and Tuesday's order of play can be found at the JTCC website. I've arrived in College Park, Maryland, where my coverage of the ITF Grade 1 International Hard Court Championships will begin on Monday, and I've just had a look at the draws and the order of play. Yunseong Chung of Korea is the top seed, and reaching a Futures final two weeks ago and a semifinal last week in Korea should have him full of confidence if not a bit jet-lagged for his first round match against Trent Bryde. Casper Ruud of Norway is seeded No. 2, and will face Alex Phillips in the opening round. Only two US boys are seeded: No. 5 Nathan Ponwith and No. 13 Sam Riffice. Ponwith plays Ammar Alhogbani and Riffice faces qualifier Oliver Crawford. Anna Kalinskaya of Russia is back to defend her title, with the French Open finalist playing qualifier Elysia Bolton. Australian Open girls champion Tereza Mihalikova of Slovakia is the No. 2 seed, and will face Juliana Valero of Colombia in the opening round. The only seeded US girl is Alexandra Sanford, at No. 15. She will play Karman Thandi of India in the opening round of play. Half of Monday's matches are at the University of Maryland courts, but I'll be sticking to the action taking place at the Junior Tennis Champions Center. I intend to watch 14-year-old Anastasia Potapova of Russia, the No. 7 seed play Amanda Anisimova, who will turn 14 at the end of the month. Anisimova and Potapova did not play at the World Junior Tennis team competition final earlier this month in the Czech Republic, with Hurricane Tyra Black going up against the Russian No. 1, but I'm sure Anisimova knows what to expect. I also plan to watch No. 7 seed Felix Auger-Aliassime of Canada, the 15-year-old who has so much success on the ATP Challenger tour. I've seen Auger-Aliassime play only briefly at the Junior Orange Bowl and last year's 16s Orange Bowl, so I hope to have an opportunity to see more this week. He plays Brian Shi in the first round. The finals of the US Open National Playoffs are set, with Monday's winners receiving wild cards into the US Open qualifying draws. Top seed Matija Pecotic of Croatia will play No. 2 seed Jesse Witten in the men's final. Pecotic, the former All-American at Princeton, defeated Hleb Maslau of Belarus 6-3, 6-1, while Witten downed Minnesota sophomore Felix Corwin 6-1, 6-3. Unseeded Virginia senior Julia Elbaba will take on No. 4 seed Jennifer Elie in the women's final. Elbaba defeated No. 3 seed Ashley Weinhold 4-6, 7-5, 6-2 and Elie beat No. 2 seed Jacqueline Cako 6-4, 6-2. 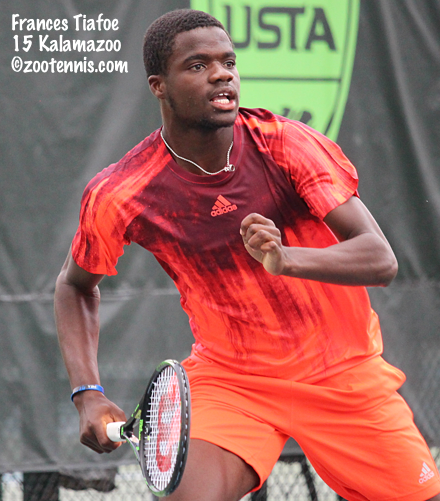 Kalamazoo champion Frances Tiafoe qualified for the main draw of an ATP event for the first time, beating Ryan Harrison 1-6, 6-3, 6-3 in the third and final round of qualifying at the Winston-Salem Open at Wake Forest. The 17-year-old will play Australian James Duckworth in the first round. Duckworth defeated Tiafoe in the first round of the ATP even in Nice back in May 6-7(5), 7-5, 6-2. For more on Tiafoe's win today, see this article from the tournament. The other Americans in the final round of qualifying lost, with Bjorn Fratangelo, Wil Spencer and Sekou Bangoura all dropping their matches. Wild card Jared Donaldson played his first round match tonight against Sam Groth and lost a tough one to the Australian 6-7(4), 7-6(8), 7-6(5). Donaldson was up a break in both the second and third sets. Although several men were forced to play two matches today in the US Open National Playoffs in Connecticut due to rain Friday, the weather cooperated today and the semifinals are set for Sunday. Three of the four seeds advanced to the semifinals in both the men's and women's draws. The only seed missing from the women's final four is top seed Ayaka Okuno of Japan, who lost in the first round Friday to Julia Elbaba, the Virginia senior. Elbaba advanced today with a 6-3, 6-0 win over 17-year-old Alexis Nelson and will play No. 3 seed Ashley Weinhold Sunday. Weinhold was way down in the third set to Megan McCray, but fought back to win the three-hour contest 7-5, 6-7(5), 7-6(4). No. 4 seed Jennifer Elie beat Sophie Chang 6-4, 6-2 and will play No. 2 seed Jacqueline Cako, the former Arizona State star Sunday. Cako defeated Gail Brodsky 6-4, 6-4 in today's quarterfinals. The only seed missing on the men's side is No. 3 Nikita Kryvonos, who lost in the opening round to Hleb Maslau (North Florida) 2-6, 6-4, 6-4. Like Elbaba, Maslau moved into the semifinals after the big first round win, beating Josh Hagar 1-6, 6-3, 6-2 in today's quarterfinals. Maslau will play top seed Matija Pecotic(Princeton), who beat Terrell Whitehurst(Florida State) and Hunter Reese(Tennessee) to reach the semifinals. Reese was an alternate who took the place of Michael Kay. No. 4 seed Felix Corwin(Minnesota) advanced to the semifinals when Mikelis Libietis retired at 4-6, 7-5, having served for the match at 5-3. Corwin will play No. 2 seed Jesse Witten, who lost only six games in his two wins today. The champions in the men's and women's singles receive a qualifying wild card into the US Open. The doubles competitions, which provide main draw US Open wild cards to the winning teams, gets underway Tuesday, with the draws now up. As with the singles, two extra teams were added to fill the fields to 16, and in the men's and women's doubles, several sectional champions are not playing. In women's doubles, Lorraine Guillermo and Danielle Lao, the Southern Cal champions, are not in draw, nor are Florida winners Lauren Proctor and Miranda Talbert. Southwest winners Savannah Slaysman and Allie Sanford also are not playing. The top seeds are Cako and Keri Wong, who won the Intermountain section. In the men's doubles, Northern section champions Jackson Allen and Toby Boyer and Southern Cal section champions Haythem Abid and Joel Kielbowicz are not in the draw. Missouri Valley champions Julio Peralta and Matt Seeberger are the No. 1 seeds. All the sectional champions are in the mixed doubles draw, with Southern California's Lao and Jonny Wang the only seeded team. The first and second rounds of qualifying were completed today at the ATP Winston-Salem Open, with several impressive performances by Americans. Sanam Singh 6-3, 7-6(2) in the second round. Wil Spencer(Georgia) beat Frank Dancevic and Ryan Haviland, both in three sets, and will play No. 5 seed Marco Cecchinato of Italy in Sunday's final round of qualifying. No. 7 seed Bjorn Fratangelo will play top seed Martin Klizan of Slovakia and Sekou Bangoura faces Pierre-Hugues Herbert of France. Bangoura defeated ATP No. 64 and No. 2 seed Lucas Pouille of France 6-4, 6-1 in the second round of qualifying today. I had an opportunity to talk with retired ATP player Bobby Reynolds when he was in Kalamazoo, representing the University of Oklahoma in his new position as assistant coach. In this question and answer session for the Tennis Recruiting Network, Reynolds discusses his love of college tennis, in no small part based on his experience at Vanderbilt, where he led the Commodores to the NCAA Team final in 2003 and finished his junior year as the nation's top-ranked player. Reynolds also provided his insights on coaching, the life of a rank-and-file ATP player, what he'll miss most now that he's retired, as well as what he sees as a need to energize the sport in the United States. I also asked him his opinion of the no-ad scoring format and of the international influence in college tennis, two topics of interest to many who follow the college game. Beginning Monday, I will be on site covering the ITF Grade 1 in College Park, Maryland, where qualifying begins tomorrow. The qualifying draws and the order of play are available at the Junior Tennis Champions Center website. Interesting to note that the top player among the boys entrants, Yunseong Chung of Korea, is currently in the semifinals of a $10,000 Futures in Korea, so whether he will be making the trip for a Monday start in Maryland is certainly open to question. The women's and men's singles tournaments at the US Open National Playoffs are underway, but due to a four-hour rain delay before play begin this morning, the first round is extending late into the night tonight. Virginia senior Julia Elbaba took out top seed Ayaka Okuno of Japan 6-1, 6-2 to advance to the second round, with other women's winners so far including Sophie Chang, Arizona State's Jacqueline Cako(2), Ashley Weinhold(3) and Megan McCray. Men who have advanced to the quarterfinals are Notre Dame junior Josh Hagar, Mikelis Libietis of Latvia, Hleb Maslau and Minnesota sophomore Felix Corwin(4). Bobby Knight has provided the collegiate affiliations and the Universal Tennis Ratings of the fields at his website College Tennis Today. The two winners will receive wild cards into next week's US Open qualifying draws. Jared Donaldson was announced today as the final wild card into the ATP Winston-Salem Open at Wake Forest, joining Gilles Simon, Kevin Anderson and Tommy Haas, who received wild cards earlier. Donaldson has drawn Australian Sam Groth, with the winner of that match facing No. 13 seed Steve Johnson. Qualifying begins on Saturday, with 16 Americans in the 32-player draw, including Kalamazoo champion Frances Tiafoe and NCAA champion Ryan Shane. Save Noah Rubin, who can't play because he is in qualifying for the US Open next week and Romain Bogaerts, virtually the entire 2014-15 Wake Forest team is competing in the qualifying. Draws and Saturday's order of play can be found here. Qualifying for the US Open Junior Championships begins two weeks from tomorrow, and the USTA has announced the wild cards for the event. Frances Tiafoe being on the list is something of a surprise; he initially entered and was accepted on the basis of his ATP ranking, but pulled out the next day. I know these decisions are never easy, but I would have liked to have seen G18s semifinalist Sara Daavettila in the field. Are there others you could make a case for? Time for a grab bag of items that have shown up in my inbox or twitterfeed in the past couple of weeks. Tuesday's match between 18-year-olds Alexander Zverev of Germany and Borna Coric of Croatia was even better than anticipated with Coric taking 7-5, 3-6, 7-6(5) victory. Steve Tignor, writing for tennis.com, took note in his account of the match. Having watched both boys since they were 11 years old, I have a different perspective from someone who is just now taking notice. I don't disagree with any of Tignor's observations, but do feel compelled to note that Coric's mental stability was not as exemplary in those early years. The moral? Some players never change, and some do. Chris Oddo also watched the match closely, and wrote this piece for TennisNow. Also at TennisNow, this interview with Frances Tiafoe, in which he says he is not the "leader" of the current crop of rising American boys. Although confident, he reiterated that point several times in interviews at Kalamazoo. Denis Kudla and his coach, former Illinois player Billy Heiser, are the subject of this article by Josh Meiseles on the ATP website. 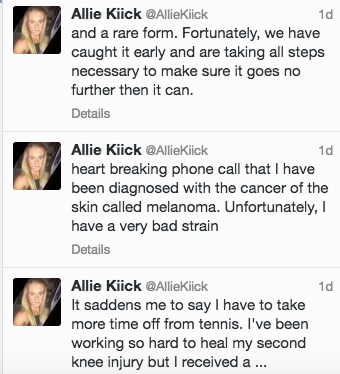 Allie Kiick revealed the distressing news that she has a rare form of melanoma via twitter yesterday. Please keep her in your thoughts and prayers. Stephanie Myles has an update on 15-year-old Canadian Felix Auger-Aliassime, who did not receive a wild card, even into qualifying, at the recent Rogers Cup in Montreal. Instead, he's sticking to juniors for the foreseeable future. As the top seed in the Canadian National 18s championships, he lost to No. 2 seed Denis Shapovalov 6-1, 6-2 in today's final. Bianca Andreescu, the top seed in the girls draw, beat No. 2 seed Vanessa Wong 7-5, 3-6, 6-2 in the final. The NCAA Team Championships' Most Outstanding Player Astra Sharma of Vanderbilt is the subject of this feature by Stefano Berlincioni at Last Word on Sports. A new website focusing on professional tennis stars off the court, outsidetheball.com, has produced its second webshow, and is currently featuring an interview with Great Britain's Heather Watson. Own The Zone, a longtime sponsor of Zootennis.com, has announced a partnership with Mats Wilander and his company WOW for the EcoGrip. Wilander's endorsement of the biodegradable grip can be found in this release, and orders can be placed here. The USTA announced the wild cards for the US Open, which begins on Monday, August 31st. Several of these were known in advance, with the Wild Card Challenge winners and National Junior champions guaranteed a place in the main draw. Below are the recipients, with ages, and their reason for receiving the wild card noted, if applicable. For those receiving discretionary wild cards their pro ranking is included. Australia returned its women's main draw reciprocal wild card, giving the USTA one more than they usually have. Last year's girls 18s champion CiCi Bellis applied for a main draw wild card, but did not receive one, so she will need to go through qualifying to get into the main draw this year. Vicky Duval, returning to competition this month after a year battling Hodgkin's lymphoma, also applied for a main draw wild card and was turned down, receiving a qualifying wild card instead. Robin Anderson, the ITA Player of the Year, was rewarded for her excellent results this summer. Pegula, who returned this winter after a long injury layoff, and Pera received wild cards over more highly ranked players Lauren Embree and Julia Boserup, who will need more withdrawals to move into qualifying. Sanaz Marand, who has posted some strong results this summer, also did not receive one and is unlikely to get into qualifying, although a doubles wild card may still be forthcoming for her. Last year's US Open girls champion and WTA 352 Marie Bouzkova of the Czech Republic was not extended a qualifying wild card, as is often customary at other slams. There will be one more wild card awarded, to the winner of the US Open National Playoffs this weekend in Connecticut. The draw has been released, with two finalists added to fill out a 16-player draw. Emma Davis, the New England winner, has apparently withdrawn, with runner-up Carol Finke taking her place. On a personal note, the girls field at the ITF Grade 1 in College Park that I'm covering next week took a hit with Arconada and Kingsley playing in Flushing Meadows instead. First, let me say that it's great that the NCAA American champions, who are not guaranteed wild cards, have been receiving them without a problem since 2009. (In 2008, Amanda McDowell was given only a qualifying wild card). Ryan Shane has been out most of the summer with an injury and hasn't had any impressive results since returning late last month, but, much like fellow Cavalier Danielle Collins in 2014, a wild card was extended. Collins drew Simona Halep, and took the No. 2 seed to three sets, so perhaps Shane can get a better draw and get a chance to show his powerful game too. Ryan Harrison's wild card was bound to generate discussion, as it's the fourth he's received in the past five years. His ranking takes much of the controversy out of the selection, as it's higher than Donaldson's and no one else is Top 200, but the case for his earning his way into the tournament via qualifying is a compelling one. He did that once, in 2010 and went on to win a match in the main draw. The only other main draw win Harrison has in New York was in 2012, when he received direct entry via his ranking. Donaldson also received a wild card last year; Krajicek will be making just his second appearance in a slam main draw, with his only previous one at the US Open via the wild card he got for winning Kalamazoo in 2008.
the US Open National Playoff winner receiving it. The draw for that tournament, with again, two finalists receiving entry as well as the 14 sectional winners, is also posted. The doubles draws, men's, women's and mixed, are not up yet, because those competitions are next week. Those are for main draw wild cards, not qualifying wild cards. The draws will be here when available. None of the teenagers who received qualifying wild cards are in any way controversial. Kozlov, Fritz and Tiafoe received qualifying wild cards last year. Mmoh, Paul and Opelka played the Grade 1 in College Park that week. The credentials of this group don't need further mention from me. Last year there were reciprocal qualifying wild cards for French players, but that did not happen this year. Twenty-four-year-old Connor Smith, at 211, is the highest ranked American player not in qualifying and not the recipient of a wild card. 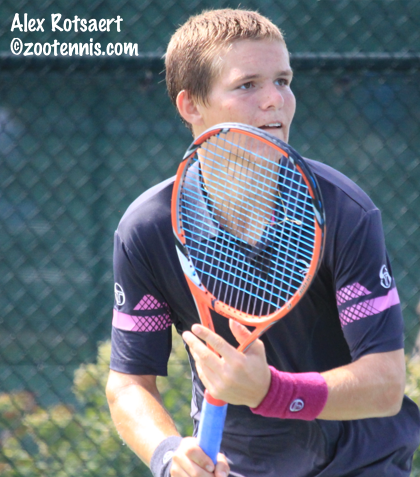 US Open boys champion Omar Jasika of Australia was also not given a qualifying wild card. His current ATP ranking is 259. My post on the women's US Open wild cards last year is here. My post on the men's US Open wild cards last year is here. Coupe Le Blanc, a competition for 12-and-under players annually in Quebec, Canada is one of the biggest international tournaments of the year for that age group, but it often gets lost in the shuffle of the USTA National Championships and the ITF's World Junior Tennis 14U team competition in the Czech Republic, also held in August. 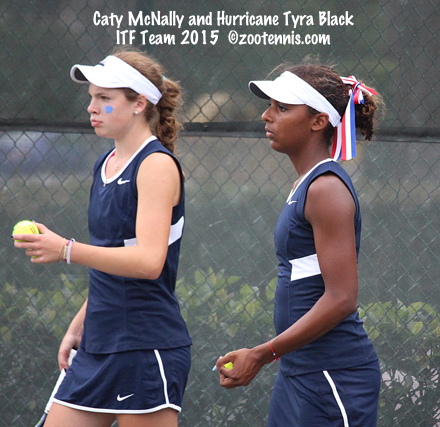 Unlike the 14U teams, only two players make up a country's team, and this year the USA was represented by girls Cori Gauff and Charlotte Owensby and boys Aidan Mayo and Benjamin Kittay. As was the case in both 2013 and 2014, the US finished first in both competitions. Gauff and Owensby defeated Canada 3-0 in Monday's final, while Kittay and Mayo took out Brazil 2-0, with the final match not played due to travel considerations. Richard Ashby of the USTA coached both teams. For a complete list of all the countries and players who participated, see the tournament website. Under the history tab, you can see the players who have taken part in the competition, dating back to 2007. 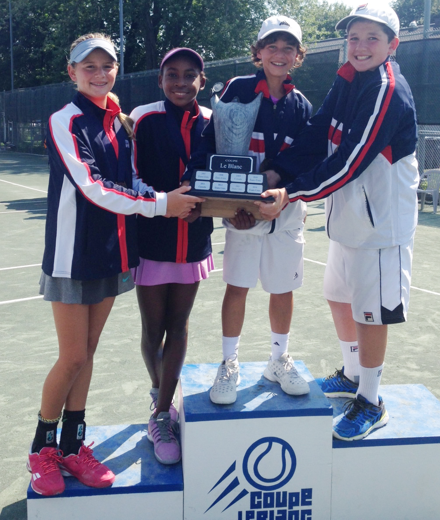 In ITF Junior tournaments last week, four US players collected titles. 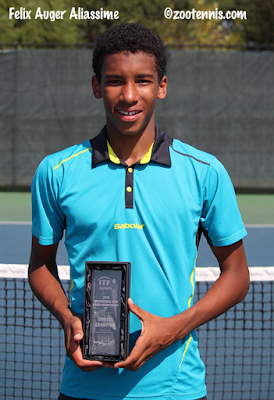 At the Grade 5 in St. Vincent and the Grenadines, 14-year-old Garrett Johns won his first ITF title, as a qualifier. The only set Johns lost in his seven victories came in the final, where he defeated unseeded Andrew Rozanov of Great Britain 6-3, 3-6, 6-4. The top-seeded US team of Kianah Motosono and Zoe Spence won the doubles title, beating Isis Gill of the US and Kiana Marshall of Barbados, the No. 2 seeds, 4-6, 6-3, 10-3. At the Grade 4 in Mexico, unseeded Paris Corley won her first ITF singles title, with the 17-year-old from Mexico beating the No. 3 seed in the second round and the top seed in the semifinals. In the final, Corley defeated No. 4 seed Alexia Coutino Castillo of Mexico 3-6, 6-4, 6-1. Another event I am not able to follow as closely as I would like given its place on the calendar is the ITA Summer Championships in Bloomington, Indiana. The prize on the line there is a wild card into the All-American Championships this fall, but this year's women's winner, Brooke Austin, will not need hers after finishing her freshman year at Florida ranked fourth in the country. Austin didn't drop a set in her six victories, beating Maddie Lipp of Northwestern(9) 6-1, 6-3 in the final. Alabama's Korey Lovett(9) defeated Jeffrey Schorsch(9) of Valparaiso 7-5, 1-6, 10-7 to take the men's singles title. Links to the final results and draws can be found at the Indiana website.